Introduction: Ber (Ziziphus nummularia (Burm. F.) is the most commonly occurring branched thorny shrub species in the Indian desert. A total of 10 Zadber accessions collected from different agroclimatic regions of India, were evaluated for phenotypic and genotypic variations using morphological and inter-simple sequence repeats (ISSR) markers. Materials And Methods: Morphological characterization was done using descriptors and Molecular characterization studies was done with fifty primers of University of British Columbia (UBC) procured from Geno Biosciences Pvt. Ltd., were used for ISSR-PCR optimisation trials. Eleven primers, which gave the best amplification results with the sample DNA, were selected for final ISSR-PCR analysis. Results: Significant variability was observed in the selected Zadber accessions by the analysis of five quantitative and 25 qualitative morphological characters of leaves, fruits and seeds. ISSR markers also showed polymorphism (86.58%). Jaccard’s genetic similarity value of ISSR was found in the range of 0.45-0.77 (average 0.61) suggesting moderate level of genetic diversity within the Zadber group. 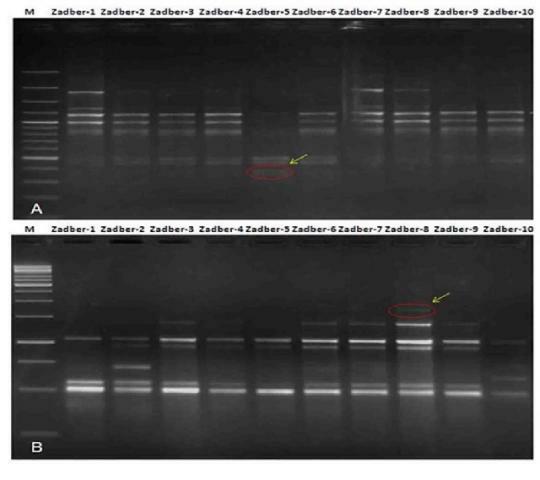 Two of the eleven ISSR primers were also able to generate cultivar specific amplicons, which may be used for identification of accessions Zadber-5 and Zadber-8. Conclusion: The present study revealed that morphological and molecular markers can be successfully utilized for determining genetic diversity and genetic relationship of Zadber cultivars and used in breeding programmes. Akhtar Y, Choudhary R, Sharma KC, Sharma M. Genetic variability and relationship studies of Ber Ziziphus nummularia (Burm. F.) using morphological and molecular markers. Pharmacognosy Journal. 2017;9(3):417-424.